SOTO CANO AIR BASE, HONDURAS — Over a weekend-long combined humanitarian and training mission, three C-17 Globemaster III aircraft and their Reserve Citizen Airmen crews from Joint Base Charleston’s 315th Airlift Wing delivered humanitarian aid to Guatemala, Haiti, and Honduras, Feb. 3-4, 2019. The three missions were planned to maintain the aircrews’ flying currency and readiness requirements, while at the same time delivering the cargoes of medical supplies, an ambulance and several tons of food to outreach organizations in their respective countries. The humanitarian aid was donated by several U.S.-based charities. Altogether, the donated cargo totaled over 88,000 pounds and was valued at around $90,000. According to the donating organizations, the aid supplies are estimated to touch the lives of nearly 130,000 people overall. These periodic missions are planned months in advance and are one of the major peacetime functions of the Air Force Reserve’s airlift fleet. They allow for aircrews to accomplish several training and readiness items, including periodic recertification and practicing perishable skills while operating in international environments, something that can’t be done by flying within the contiguous U.S. According to Tech. Sgt. Wil Lee, loadmaster with the 300 AS, these missions provide opportunities for the loadmasters that are difficult to replicate in other missions. Loadmasters are responsible for managing the cargo while the aircraft is in flight. “Loadmasters have to fly at least every 60 days, and this mission will keep us current for another 60,” said Lee. Additionally, another loadmaster completed a checkride – an 18-month recertification requirement. The pilots also gain valuable experience from these combined training and humanitarian missions. 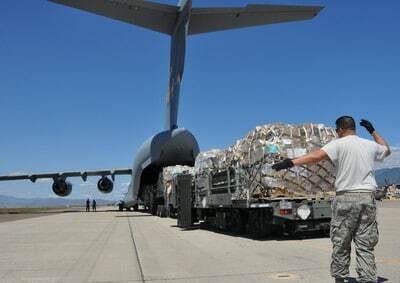 The cargo was donated by charities within the U.S. and airlifted in conjunction with the Denton Amendment, a State Department/USAID program that enables humanitarian charities and U.S.-based nongovernmental organizations to use space available on military cargo aircraft to transport humanitarian goods to countries in need. Consequently, these missions are flown at no additional cost to the U.S. taxpayers. Once delivered, the cargo will be received by local outreach organizations, who then distribute the supplies. Special precautions are taken to ensure that the cargo benefits the intended recipients.